Our lineage is authentic and still intact today. Click on the or icons in the image below for more information. Director of the North American Beikoku Shido-kan Karate-do Association and currently the highest ranking Okinawan master in the United States. He started karate at an early age, became a student under renowned master Shinpan Gusukuma in 1950 and Katsuya Miyahira in 1954, and then moved to the United States in 1967. Sensei Iha is respected worldwide for his tremendous practical knowledge of karate technique as well as for his warm, engaging and expert teaching style. Learn more on IhaDojo.com and Wikipedia. Miyahira Sensei began training with Chibana Sensei in 1933 and was promoted to 9-Dan Hanshi in 1967. He also was instructed by Choki Motobu Sensei and Anbun Tokuda Sensei. Upon Chibana Sensei's death, Miyahira Sensei formally received the HANKO (official seals of the organization) and in 1969 was voted president of the Okinawa Shorinryu Karatedo Kyokai. 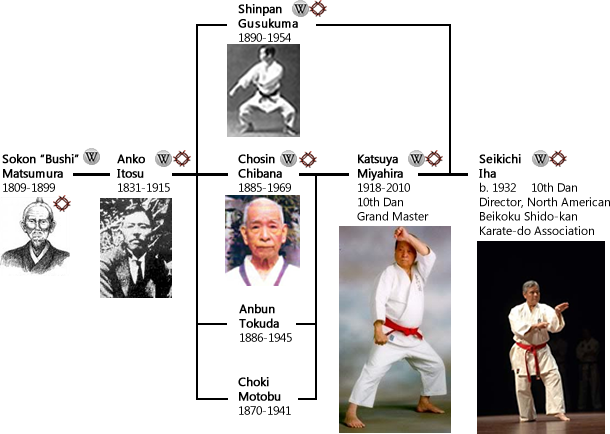 He has a very long and distinguished history worth reading about..
Chibana Choshin, the originator of shorin-ryu ("the small forest style") began training with Itosu "Ankoh" in 1900 at the age of 15. Both Chibana Sensei and Tokuda Sensei were among the best students of Anko Itosu Sensei, the master of the Shuri style (Shuri-te). More on IhaDojo.com and Wikipedia. Please leave a message and we will call you right back to answer any questions. Website by BLUE Productions, LLC.